Behold, the Motorola Olympus? Perhaps. 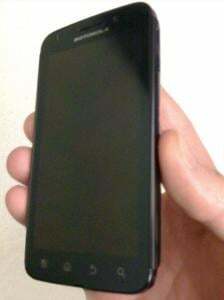 This may well be the rumored Tegra 2-powered smartphone from Motorola. The Olympus name's been floating around for a while now -- including one likely fake about screen -- with no real proof to back it up. The tipster -- who apparently shopped these pics around a couple of places -- offered no details with the leaked pictures (there's one more after the break), so we've got to go with what we can see.